There is no limit to the ways you can announce to your partner, parents or friends that you’re pregnant. You could go for the super-casual: “Honey, can you pick up some bread and milk on the way home? Oh, and I found out I was pregnant today. Hey, wait, we’re out of mustard too. Bye.” Or, you could create an elaborate Britney Spears–themed parody video, go viral and get the whole world’s attention1. It all depends on your mood: fun, serious, romantic or quirky. One of life’s most exciting milestones is when you find out you’re pregnant. It doesn’t matter if it’s the first time, the third or the sixth (yikes!) – it’s always memorable. Sometimes it can be tricky choosing the right time to reveal your thrilling news. On the one hand, you’re excited and you want your friends and family to share in the exhilaration. One advantage of an early announcement is that you don’t have to pretend you’re not pregnant. There’s no need to make excuses for your weight gain, refusal to have a glass of wine, exhaustion or morning sickness symptoms. Plus, you’ll have your family’s support early on in the process. Some women prefer to keep their baby news private until the end of the first trimester (10-12 weeks) or even later, just in case any problems arise with the pregnancy. Ultimately it’s a personal choice that depends on your circumstances. When your partner comes home from work, tell him “I made something special for you. It’s in the kitchen.” When he goes in, he’ll smell something in the oven, take a look and notice there’s a bun in there. At this point, he’ll either (a) get the bun-in-the-oven reference immediately, start grinning and give you a hug, or (b) wolf it down, briefly wonder why you made just the one, say “thanks, love” and head off to take a shower. Try putting a poppy seed on a saucer with a note saying “It’s only this big now, but growing fast”. If you’re a bit further along, a pea works too. It’s probably best not to wait until the baby is watermelon-sized. Place a baby item somewhere in the house. This can be a crib set up in the spare bedroom, a tiny bib hanging on the kitchen towel rack or a baby bottle mixed in with the coffee cups. If nothing else, you’ll soon learn how observant your partner is. Text your partner a stock photo of an ultrasound (you’re probably a bit early to have your own) or a photo of a pregnancy test showing a positive. Then await the inevitable phone call. A word of warning – when sending secret text messages, don’t accidentally hit the wrong button and email it to your entire contact list. Whether your parents are already grandparents or not (sometimes your older sibling beats you to it), they’ll be thrilled to hear about your new arrival. After all, expecting a child isn’t something that happens all the time (unless you’re that Russian peasant lady from the Guinness Book of World Records2 who managed a total of 69 births). Though there is usually some good-natured grumbling about ‘getting old’, your parents will be looking forward to spoiling your child shamelessly in the years to come. One way to tell your parents you’re pregnant is to buy a blue balloon and a pink balloon. Then have them hanging in your living room when they visit. Then ask them which colour they think you’ll need. If this is your second child, feel free to use your toddler to help spread the news. Have them wear a tee shirt with something like ONLY CHILD – EXPIRES August 13, 2016 on the front. I’M BEING PROMOTED TO BIG SISTER IN MAY is pretty cute, too. This is where social media can earn its keep. 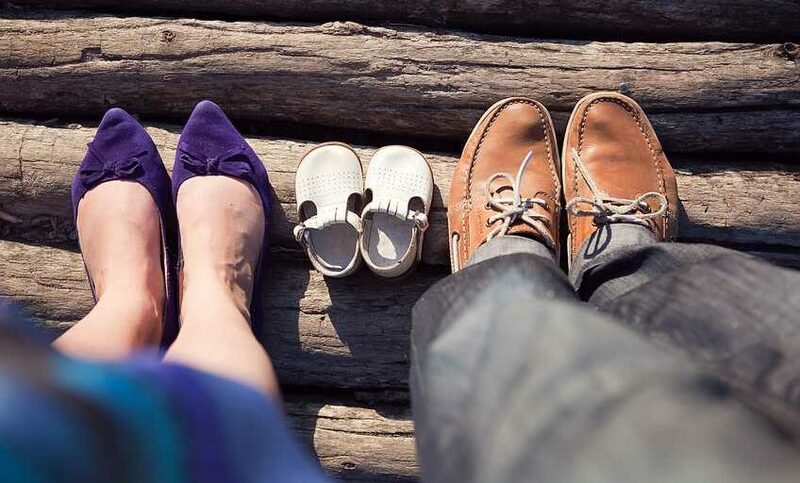 An Instagram photo featuring three pairs of shoes – one male, one female and one miniature – can get the message across. A photo of the two proud parents standing next to a BUMP AHEAD road sign isn’t original, but works too (especially if your hand is over your stomach). The very best way to announce your pregnancy is one that reflects your personality. Put baby food in your partner’s sandwich. Hire a sky-writer if you’re rich enough. Borrow a friend’s mini-drone, tie a stuffed wombat to it, dress it in a nappy and have it buzz over your partner’s head while you’re both walking in the park (awesome until the drone gets out of control and knocks one of you unconscious). Covertly suspend a pair of baby booties from the knob of your parent’s front door. Be like Frank Sinatra – do it your way.